Winter fishing in Nusfjord, Lofoten. In Northern Norway, the fish bite best in winter. Get an easy catch when skrei (migrating cod) appear by the coast, go ice fishing or try king crab fishing. Some of the worlds best deep-sea fishing waters can be found off the coast in Northern Norway. Many people stay for weeks in the small fishing villages while trying their luck at sea. 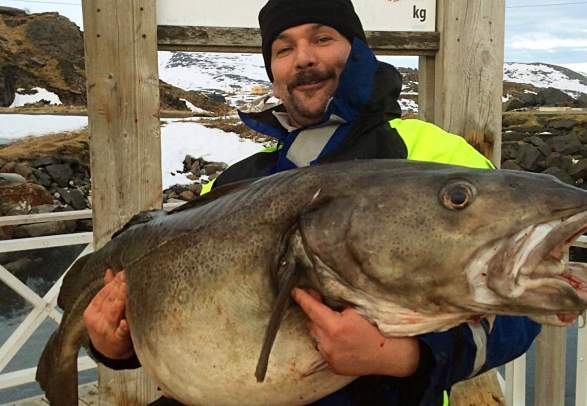 In March every year, passionate sea anglers and happy amateur fishermen from all over the world come to the Lofoten Islands to take part in the World Championship in cod fishing, landing giant cods of up to 30 kilos. Northern Norway is called "the cod capital of the world", and for a good reason - Lofoten has had the biggest cod fishing industry in the world for many generations. But the low season in Northern Norway is not "just" about cod - it is also about the spectacular northern lights above your head, exciting whale or king crab safaris, and mile after mile of skiing adventures. Winter fishing with Big Fish Adventure. Sleep in a cosy rorbu or holiday house, rent a boat and enjoy a guided fishing trip in the hands of experienced professionals. Get an easy catch when skrei (migrating cod) appear by the coast, go ice fishing or try king crab fishing. Even though the Arctic cod only shows up once a year, it has been paramount in shaping Lofoten as we know it today.